MainAll NewsInside IsraelTechnical Bloc: Otzma Yehudit-Ha'am Itanu Unity? Technical Bloc: Otzma Yehudit-Ha'am Itanu Unity? Ben-Gvir reveals Yishai hedging against joint list with Ben-Ari's party out of desire to join Netanyahu coalition - but there is a way. Attorney Itamar Ben-Gvir of Otzma Yehudit told Arutz Sheva that while there has been a call for the nationalist party to run jointly with Eli Yishai's Ha'am Itanu, Yishai apparently is leaning away from such a joint list - but running as a technical bloc may just be the answer for the two to form an ideological right-wing religious bloc. The reason for Yishai's hesitation appears to be that he intends to join a potential coalition government formed by Prime Minister Binyamin Netanyahu, who reportedly strongly supports Yishai. Netanyahu apparently would balk at letting Yishai join if former MK Dr. Michael Ben-Ari's Otzma Yehudit was together with him. However, if the two parties ran together as a technical bloc, the two would be able to feature a joint list in elections and as soon as the day after - if they wanted to or the political situation required doing so - they would be able to separate from the bloc and retain their seats. "A connection between the two doesn't mean entry (to the Knesset) as a member of Yishai's party. We aren't there. We can enter as a technical bloc and after the elections, Netanyahu can say he wants these three and to put Ben-Ari and his partners on the side. That's possible," said Ben-Gvir. 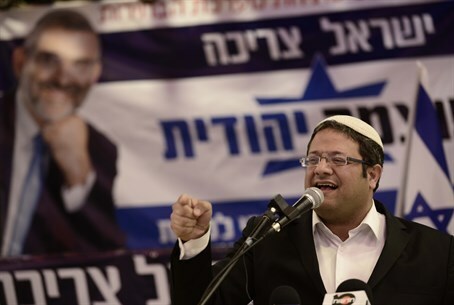 Ben-Gvir commented that there are a lot of connections with Yishai's party, which also is running on a religious right-wing platform. "There are some voices among us who say (Yishai) is too much of a compromiser, but overall for the good of the nation of Israel and so that tens of thousands of votes don't get thrown away a connection like this which will form a good burst for Israel is important," he said. Otzma Yehudit head Ben-Ari, who in the past was in the Knesset in Uri Ariel's National Union party, ran on a similar "technical bloc" when he joined Ariel's party, notes Ben-Gvir. At the time an agreement was made that Ben-Ari could separate from the party on the day after elections given the different ideological focus of the two. "But Netanyahu didn't want Ben-Ari, or Uri Ariel or Katzelah (Ya'akov Katz) and it's clear why - a coalition of the Bar Ilan speech and building freeze," said Ben-Gvir, referring to Netanyahu's infamous 2009 speech supporting the creation of a Palestinian state in Israel. According to Ben-Gvir, while there are contacts with Yishai's party, "they aren't at the level that they need to be at this stage." "If there won't be a connection between us and Eli Yishai we will run in these elections alone," clarifies Ben-Gvir. "We can't accept a decision not to run. Tens of thousands of votes of voters who won't take part in elections for any other party will be thrown away. They won't be able to vote. I hope that for the interest of the right-wing camp there will be some sort of connection." Speaking about the party's chances, Ben-Gvir noted how the recent flurry of polls have completely ignored Otzma Yehudit, not including them in their results. The attorney related that activist Baruch Marzel, a member of the party, contacted one of the leading pollsters in the media and asked "how is it possible we aren't there (in the polls)?" The answer was "you aren't there because we aren't asking about you." When Marzel asked what needs to be done so that Otzma Yehudit will be included in the polls, he was told by the pollster that only after Otzma Yehudit pays him money to work with them "only then we'll ask about you." "Those who actually ask know that we are on the edge of the threshold," said Ben-Gvir, referring to the 3.25% limit needed to enter the Knesset which was raised by the last coalition government. "Today there are a lot more who are disappointed with the politicians of Jewish Home, (Avigdor) Liberman and Likud." "I can't say that we will receive three or five mandates but we are running for the Knesset because Ben-Ari is a man of truth and we need to put Jewish strength (Otzma Yehudit's name - ed.) into the Knesset," said Ben-Gvir. "There has to be someone to the right of (Naftali) Bennett. We need to erase the smile of (Ahmed) Tibi and (Hanin) Zoabi." Ben-Gvir added that Yishai's party won't serve as the answer for ideological right-wing religious voters, saying "Eli Yishai is a suitable guy but he isn't a replacement for Ben-Ari, neither is (Yoni) Chetboun and others in that party. They won't give the ideological tone and won't be the ideological compass in the next Knesset. There has to be someone who will represent something different." If Otzma Yehudit and Ha'am Itanu were to run together, as noted the question of how that would affect joining a Netanyahu-led coalition becomes a key question. "If Netanyahu drops his idea of two states and stops the freeze and freeing terrorists maybe we'll (be able) to see ourselves in a coalition. If not - there has to be a compass in the Knesset that will say things there. In a situation like that our tens of thousands of voters won't be satisfied with Eli Yishai, with all due respect and appreciation," said Ben-Gvir.